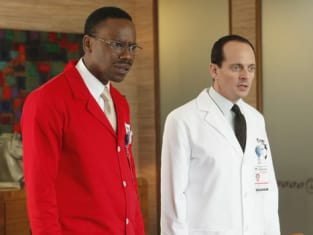 Better Off Ted Review: "It's Nothing Business, It's Just Personal"
With ABC rushing to finish up Better Off Ted's second season, we need to enjoy the show while it lasts, even if they go yet another week without giving us a Veridian commercial. 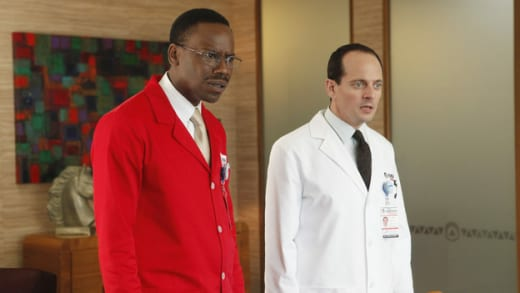 Luckily, the B story "It's Nothing Business, It's Just Personal," in which Phil and Lem attempt to figure out why the company stuck a red lab coat in Phil's locker, was remisicent of the fantastic first season. It turns out Veridian makes random changes to the workplace to increase productivity, and in Better Off Ted fashion, it works. Now that's the Veridian we know and love. Meanwhile, the A story saw the return of the fantastic Mordor from last year's season finale, and his character was fleshed out to be more than just a magician. Apparently, besides having just an awesome name and a great set of hair, Mordor is a relentless lover. We love anything that brings out the b*tch in Veronica, and Mordor's indiscretions certainly did that. The A story provided plenty of smiles, but it didn't have the laugh out loud reactions of the first season or even of this episode's B story. Phil: Wow. Can you imagine how great it would be to just take Veronica out in the middle of the day and have lunch with her? Ted: This... this is about Veronica. See, she has a very high-pressure job. And she does it with 100% focus. Mordor: Oh, she's the same in bed. Or when dismembering a goat. This weekend, Mordor and I am going scuba diving. Last weekend we raced cars in the desert and ate a rattlesnake... and a goat that wandered into our camp, and then a light salad. It turns out developing cheese that never spoils is harder than we thought. Right now, it's more of a cheddar-colored fabric that does spoil.